– Did you know that every third person on the planet is lacking a toilet? Without toilets, people are at great risk of lethal epidemic diseases such as cholera and diarrhea, which is killing 1.4 million children every year. Lack of toilets is also the major reason why many girls in urban slums do not finish school. In Nairobi, IAS together with local partner Peepoople Kenya is bringing Peepoo toilets to schools in the slum, to give children a better chance to remain in class and stay healthy. After use, Peepoo turns into valuable fertiliser that can improve livelihoods and increase food security. In a typical primary school in the world’s slums, the state of the sanitary facilities and the level of the children’s hygiene are poor. Often hundreds of children have to share single pit latrines. In many schools toilet floors can be covered with fresh faeces and are wet with urine. Children without shoes are left with no option but to stand barefoot in this mess to relieve themselves. For girls who are approaching puberty the situation is even more severe. About one in 10 school-age girls do not attend school during menstruation and many also drop out of school due to lack of clean sanitation facilities. Having a personal toilet in school helps the girls to finish their education. One of girls that is happy for this personal toilet is Doreen Indasi, 13, Kibera, Kenya. The Peepoople product is being distributed to 100 schools and more than 20 000 school going children living in the Kibera slum in Nairobi, Kenya. Stockholm 18th October 2016 – It is with great pleasure we announce that the Peepoople innovative brand and product will continue to be developed by International Aid Services (IAS) as from today’s date. Peepoople and IAS began the cooperation in year 2014. With the change in strategy from having a high-tech production in Stockholm, Sweden, towards a local production closer to the market, IAS became the first choice for Peepoople. – The last years of partnership with IAS has been a game changer for us in Peepoople and we are excited to see how this free transfer of the brand to IAS can create an increased ownership amongst the target group that we intend to reach, says Anders Pihl, CEO of Peepoople since 2014. Today, the Peepoople product is being distributed to more than 20,000 people (mainly women and children) living in the Kibera slum in Nairobi, Kenya. Peepoo is a personal, single-use, self-sanitising, fully biodegradable toilet that prevents faeces from contaminating the immediate area as well as the surrounding ecosystem. After use, Peepoo turns into valuable fertiliser that can improve livelihoods and increase food security. – Fantastic to see this innovative product being used Worldwide and in particular Kenya. We believe that the product plays an important role in providing not only a sanitation solution but also in terms of protection of women and children using it in insecure areas, says Andreas Zetterlund, Head of Marketing & Fundraising Department at IAS. As we commemorate this World Humanitarian Day (August 19th, 2016), IAS reflects on current trends and issues in the Humanitarian circles. The Humanitarian situation around the world continues to pose many challenges, as needs increase, and the response capacity is usually limited due to financial restrictions. As natural disasters affect communities, many others are also being affected by man-made disasters, including wars and terrorism, which put humanitarian workers in harm’s way increasingly. Despite this, IAS continues to engage in some of the most hard-to-reach areas and seek to alleviate the human suffering there. IAS is actively responding to various humanitarian situations in different countries. Notable in the past three months are rapid responses that IAS has engaged in as various disasters have unfolded. 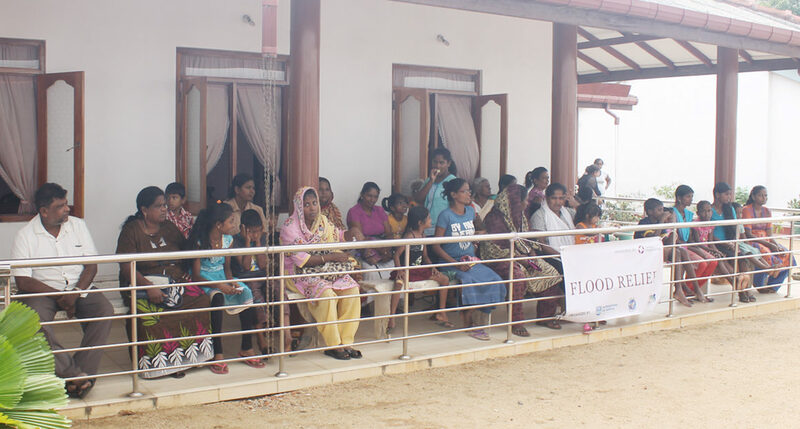 In response to flooding that happened in Sri Lanka in May 2016, IAS partnered with local actors and rose up to alleviate the suffering of affected people. The floods led to the overflowing and back-flowing of toilet systems in the poorer areas of the city, in addition to the loss of household properties as water filled houses to about 6 feet for seven days. 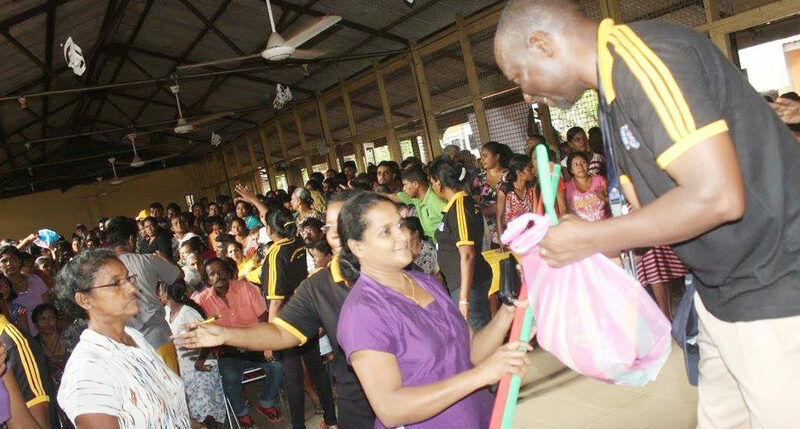 IAS responded by helping with the cleaning up of household and communal toilets in selected neighbourhoods of Kollonawa, Colombo, with the aim to enhance hygiene conditions and save lives. Outside the city of Colombo, in Hanwella, shallow water wells were filled with over-the-ground water, making the water unsafe for human consumption. While a well-cleaning response was just commencing, part of the area was hit by another disaster as an army ordnance depot blew up and led to substantive destruction of property, including water wells. A response in the area has brought hope and smiles to the affected communities as they were struggling to find clean water. Above these, the dignity of women and children has been upheld by the provision of basic survival hygiene items. Attacks by Boko Haram in the Lake Chad region of Niger in June 2016 led to the displacement of communities in the area, with many of them flocking to the town of Diffa in Eastern Niger. IAS, being already engaged in the provision of clean water to the IDP communities there, engaged in the provision of basic household survival kits to help the newly displaced people. The basic critical household items, and some food, have helped the affected people to begin rebuilding their lives in difficult circumstances. The effects of the El Nino phenomenon have been felt in various countries in Africa, mostly indicated by severe food and water shortages. IAS has been working in the Borena Zone of Ethiopia for several years, working on alleviating the acute shortage of potable water. With the setting in of this current drought, IAS has embarked on the provision of emergency water through truck deliveries, while the longer-term solution is being sought by the drilling of boreholes and construction of water collection ponds. This will help in alleviating the suffering of communities and control the forced migration that would have occurred due to the need. While IAS has been engaged in responding to the crisis-affected communities in South Sudan over the past two years both in South Sudan and Uganda, the fresh outbreak of hostilities in Juba on July 7, 2016 has led to new levels of humanitarian needs. 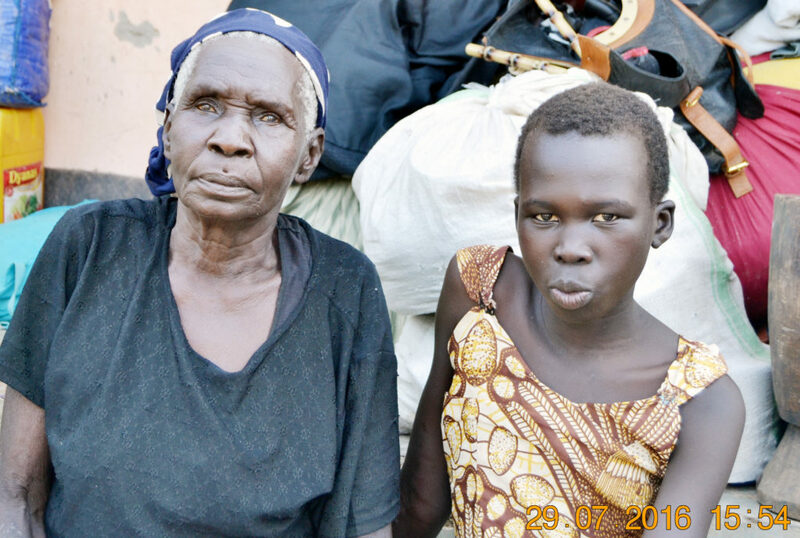 Leading to the evacuation of staff and temporary suspension of activities among affected people in South Sudan itself, the flight of South Sudanese women and children across the border and influx into Uganda has challenged the humanitarian community. Conditions continue to be dire in the reception centres and newly opened villages. IAS is responding to the WASH needs of the displaced people and striving to help them rebuild their lives. With most of the men restricted from leaving South Sudan, the women and children that arrive face many challenges (see our earlier story at http://www.ias-intl.org/response-to-the-South-Sudan-crisis). So, as we commemorate this day, we think of the communities that have suffered, and continue to suffer, not only in Sri Lanka, Niger, Ethiopia, and South Sudan/Uganda, but also those in other places facing dire needs. We appreciate our supporting partners, largely in Sweden and Denmark, who have encouraged us and mobilised financial resources to enable us respond accordingly. So, as IAS we will rise up, hold hands with supporting partners, and engage in saving lives in the other hard-to- reach regions of Yemen, Lake Chad Region, Syria, Somalia, and beyond, and alleviate the suffering of communities in those areas, as we remain Fit for Purpose. Since Wednesday the 7th July 2016, heavy fighting broke out between the South Sudan ruling government and forces loyal to the 1 st Vice President Mr. Riak Marchar in the South Sudan capital Juba spreading to other parts of the country. Although not clearly quantifiable, huge destructions of property, loss of lives and other forms of suffering is being reported on media such Aljazeera, CNN, National Television (NTV) and much is awash in the local newspapers here in Uganda. I travelled to the NW part of Uganda (Arua, Koboko, Adjumani and Yumbe Districts), where most of the refugees arrive in Uganda, to see for myself the refugee situation having been in a meeting at the UNHCR offices in Kampala. The young girl is called Gonya Rose (12 years). She was in Primary 4. Her mother died before the war and the Father remained in Juba. They have no idea if he is alive or dead. She is the only child they had. She walked together with her grandmother for a week, before they crossed the border. 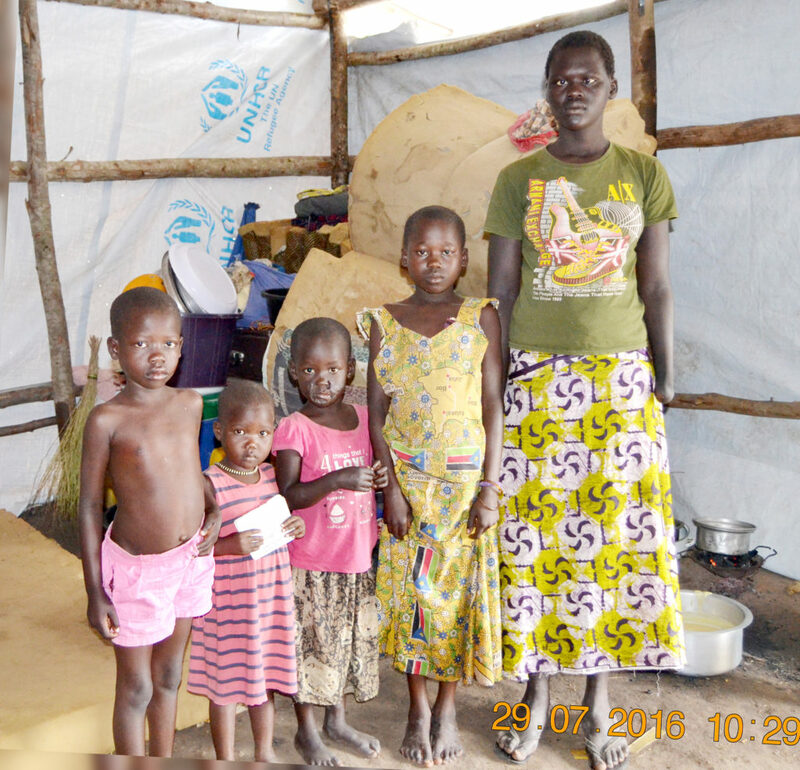 Here is a Child Headed family (unaccompanied minors) of five members all from Yei. These children share a father with different mothers. They are all total orphans; they were helped to come to Uganda by their neighbour. The older girl, who was in school while in South Sudan, is now taking care of the young ones. Scovia was in P.4 and Nancy was in P.1. They walked from Yei to Kaya (Approx.70km), boarded a public vehicle paid for by their neighbour to Keri where they were picked up by a UNHCR truck to Rhino camp. When I arrived to one Settlement called Rhino Camp, I am left without words at the suffering of the refugees from South Sudan. The situation is quite appalling that one can’t fail to shed a tear due to the magnitude of the problem, with few humanitarian actors. Over 80% of the new arrivals consists of women and children. There are also quite a number of Child Headed families (Unaccompanied minors). The others are the aged who have managed to come over for now. Over 71,499 refugees have crossed the border into Uganda since the 1 st of July, and the number is increasing. On a daily basis the new arrivals are in thousands. Many of those I did talk to thanked God that they managed to cross into Uganda because many didn’t make it. The challenge right now is that the period ahead of us is the heaviest rainy season in Uganda, so a daunting task is yet to come both for the refugees and the agencies who are responding. IAS is on ground responding to the crisis together with other sister agencies, but the challenge is huge since there isn’t sufficient funds to take care of this immense catastrophe that has befallen these people. – Water is a problem. The few bore holes cannot accommodate such big population. Drilling of new bore holes is much needed. – Provision of water drinking containers to at least 5000 Households. Temporary overnight communal shelters to be used prior to construction of household dwelling shelters. As I write these words the closing ceremony of the World Humanitarian Summit (WHS) has just commenced. The culmination of a two year consultative process. A springboard. An interruption. The beginning of something new? Or the continuation of something that was? Or an exhaustive attempt to bring life into a fragile world and a broken system? About an hour ago I boarded Egypt Air, flight MS736, bound for Cairo and then Juba. Surrounded by a ten centimeter metal shell I now gaze at the horizon. Yesterday pieces from another shell were washed up on the beaches of Alexandria. A shattered shell. The man who welcomed me on board had an empty look in his eyes. Perhaps it was one of his friends that passed away last Wednesday when Egypt Air lost sight of one its planes crossing the Mediterranean? An aura of stillness rests within the aircraft. WHS was in many ways both a striking and well-orchestrated event. A grand finale for Ban Ki-Moon’s tenure of service as the Secretary-General. Mr. Moon was surrounded by Heads of States, celebrities, other important people and the rest of us small people. A total estimated number of 6 000 people were allegedly enjoying the spaces of WHS for the two days. The opening ceremony, one of the more impressive I have witnessed, saw great speeches and awe-inspiring performances. Ashley Judd (my all-time favorite actress in my earlier years) expressed: ‘How the world is responding to the current global crisis is a crisis in itself. We have to rethink and improve’. Mr. Bond, James Bond aka Daniel Craig, was next in line to enter the stage. Fitting to the occasion he left his firearms at home and was both ’shaken and stirred’. Centered around the main heading of One Humanity – Shared Responsibility and with several core humanitarian themes and responsibilities, as well as hashtags such as #ReShapeAid and #Sharehumanity, people talked and tweeted away. These are big words. With big words come great expectations. Many had probably expected WHS to generate a small revolution for humanitarian action. I am afraid their expectations were not met. It is more complex than that. Many had also been overall highly skeptical of WHS as a whole. That it would be paying lip service and that their voices would not be heard. That is true. Not all voices have been heard. Nor can they realistically be. But there were voices. Voices that spoke up on behalf of those who couldn’t. A few rows ahead of me sits a bright young lady. She is deaf and comes from South Sudan. She coordinates a network of women who fight for the rights of those with disabilities. She spoke in Istanbul, both on behalf of herself but also on behalf of others. One of the results of her and others’ fight is the Charter on Inclusion of Persons with Disabilities in Humanitarian Action. It got traction. It got signatures. Even from Member States. A bold step forward. How we treat the most vulnerable provides a temperature gauge of our society. The role of faith and its relevance in humanitarian action was also for the first time brought to a global level. We work in contexts of faith where people believe. Faith, not the absence of it, is the norm for most people. Faith moves us into action. Pushes us forward. Faith can move mountains. There was no consensus reached around the role of faith, but it is now on the agenda. Something which we need to take into consideration. A good initiative in this regard is the Joint Learning Initiative on Faith and Local Communities. Its research and evidence papers around the role of faith in humanitarian action are important and worth reading. Financing was another theme discussed at the WHS. The Grand Bargain is one of the suggested solutions. The idea is that donors will commit to more flexible, multi-year funding, with less burdensome reporting requirements, in exchange for major agencies committing to greater transparency and collaboration and reduced management costs. Today we assist more people in need than ever before. Yet, this is not enough, there are still proportionally even more people in need than previously. There simply isn’t enough cash in the system. We have to both spend it right and expand the circle of donors. This also touches on the nexus on what separates humanitarian from longer term development aid. From a practitioners perspective this is more or less irrelevant and the line is blurred. Surely there are different normative frameworks that guard the two systems, but the person at the center receiving assistance couldn’t care less if the assistance received is to be categorized as humanitarian or development aid. In light of this it was refreshing to hear at least some donors committing to allocate multi-year funding for humanitarian action, something we and the NGO community have long advocated for. Many of the solutions proposed during the WHS are not new. They’ve been around for some time and should, to some degree, also be viewed as certainties, such as putting people at the center. Nevertheless, and something which was my personal expectation, it can hopefully provide a reference point for further dialogue. A dialogue aimed at identifying constructive commitments and decisions by Member States, UN, NGOs, corporates and individuals. There will be a need to exhort enormous political will clothed in great humility if we shall get this underway. We have a choice. A famous and successful Swedish football coach once said: ’I choose to coach the good (jag väljer att coacha det goda)’. There’s way too much cynicism in this world. Especially and ironically among us aid folks. Too much rivalry and competition. It makes me sick. In the spirit of greater professionalism within the humanitarian sector; let us not lose sight of its historical core values and drives, such as heart, passion and true altruism. We need to change. Be transformed. The sector needs to change. This we know. We are not naive. It would be easier to surrender. Pull out. Not engage when things do not work according to one’s plans. But we all have a choice. I choose to make an active choice of continuing to stay positive. To focus on the good. The mission is huge. Overwhelming. Suffocating. It can cause us to get paralyzed. But that’s when we need to breathe deeply. Stretch further. We have to allow ourselves to be moved. Through our own vulnerability and our own inadequacy go to the source. Renew our strength, look up and never give up the good fight. Thank you dear committed and wonderful colleagues at IAS for taking part in this fight. Tomorrow we at IAS will formally start to address and define our commitments in regards to the outcome of WHS. But today I allow myself to reflect and pray for a broken and fragile world. To accept the things I cannot change and to receive courage, strength and assurance for the things I can. Today, IAS is launching its new global strategy for growth called; Fit for Purpose. The strategy outlines IAS desire to deepen its engagement in its current countries of operation and expand into new geographical regions. The focus for the geographical expansion is Middle East/North Africa and Sahel. Founded in 1989 with the purpose of assisting conflict affected populations in South Sudan, IAS is currently registered and runs programs in over 10 countries in three key operating regions: Sahel, Greater Horn of Africa and Eastern Africa. The expansion of IAS has always been strategically driven by need, injustice and the fact that no one else is responding to the needs of the population. This strategy is a result of a renewed and sharpened vision to continue to build on IAS foundation to serve and reach out to the most vulnerable and underprivileged populations. 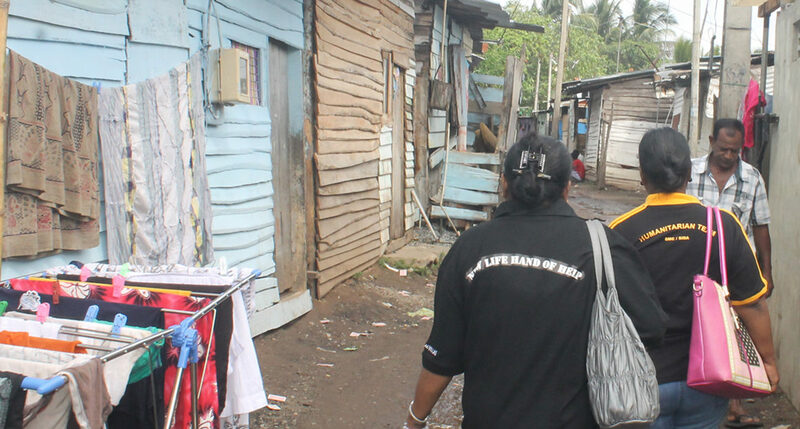 IAS will continue to sustain what we have, while we expand and grow by assisting populations in other regions. -Expansion in these regions means adding resources, not draining existing ones. While maintaining true to IAS core sectors and competencies, it might be that the programs will take other shapes, with other administrative setups. In order to see transformational change in this context, the key is to ensure long term physical presence by core staff consumed with the vision of IAS, says Daniel Zetterlund, CEO. -The Swedish Board is excited to see this strategy being launched. We believe it will be a crucial tool for the further enhancement of IAS in the next years to come. While the initial timeframe of the strategy is set to five years (2016-2020) we are committed to the long term vision behind the strategy, says Agneta Kuhlin, Chair of the Swedish Board. The expansion of IAS has always been driven by need, injustice and that no one else is responding to the needs of the population. The foundation for the growth has been our core values of missions, integrity, relational leadership and team work, empathy (compassion) and equality. With this global campaign called ‘Together #WeDigDeeper’ we wish to continue to build on this foundation. We will continue to serve the unreached and underprivileged population. We will continue to stay true to our calling and mandate. 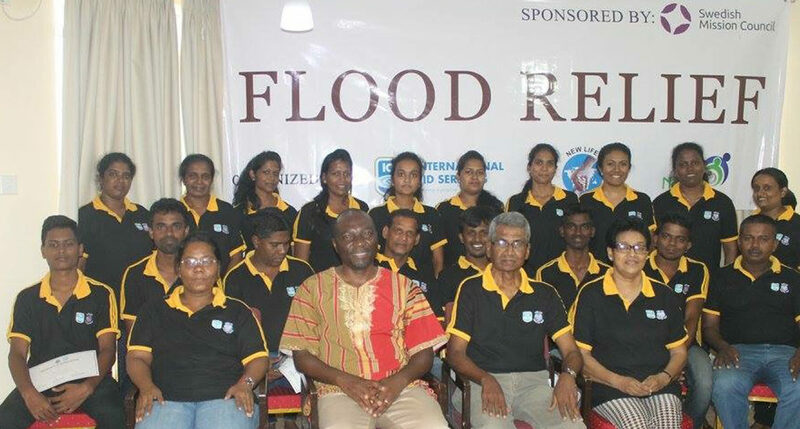 We will sustain what we have meanwhile we continue to expand and grow into assisting populations in other regions. We want to be fit for purpose. But we need your help.